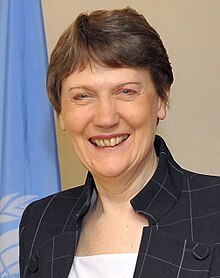 I sat down with Helen Clark, Prime Minister of New Zealand from 1999 to 2008, to talk about her country’s experience with electoral reform. She was in Kamloops on June 21 at a reception held at a local pub where about 70 people had gathered. “You have five minutes for the interview,” the organizer of the event told us. We made our way to a quiet table. Two referenda were held in New Zealand, she told me. The first in 1992 was non-binding. It asked whether voters wanted to retain the present first-past-the-post (FPTP) system or if they wanted a change. And if they wanted a change, which of four systems of proportional representation did they prefer? The results were overwhelming with 85 per cent in favour of a change. Of the four systems, Mixed Member Proportional (MMP), was a clear favourite. A second referendum was held a year later. This time the referendum was binding and the results closer with 54 per cent choosing MMP over FPTP. After 20 minutes, I had asked all my prepared questions and we just chatted. “I thought the interview was only going to be five minutes,” the organizer scolded when he found us. Ms. Clark returned to the group where photos were taken and she gave a speech. Afterward, I thought about the similarly of our upcoming mail-in referendum this fall to the one in New Zealand. Two questions make sense to me: Do you want a change? If so, want kind do you want? However, a B.C. lobby group called Fair Referendum disagrees. In a robocall call, they said that there should be just one question. I had to chuckle. The Fair Referendum proposal illustrates what’s wrong with our voting system. They want a single question with four choices, three of which are a type proportional representation and one being the existing FPTP. Those in favour of change will have their vote split three ways and those who don’t want change will have one choice. The ballot is rigged so that even if, say 60 per cent want change, 40 per cent will make sure it doesn’t happen. It seems obvious that’s what Fair Referendum hopes for. The referendum, to be held from October 22 to November 30 by mail-in ballot, is shaping up along party lines. The Greens and NDP favour proportional representation and the BC Liberals oppose it. Kamloops-South Thompson MLA Todd Stone says the referendum would be biased in favour of the NDP and that’s probably true –but only because the BC Liberals choose not to cooperate with other parties. The Greens and NDP have made an extraordinary effort to be nice to each other because, as Ms. Clark suggests, it’s the only way that future governments under proportional representation will work. It’s a shift in party culture that the BC Liberals have yet to realize.